Draft: 2015, Oakland Athletics, 1st rd. 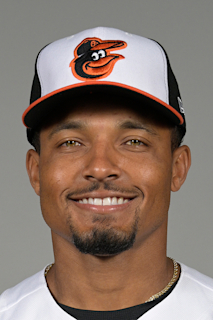 Graduated from Bloomingdale (NC) HS…Played collegiality at the University of Florida…Originally drafted in the 38th round of the 2012 First Year Player Draft by the Seattle Mariners (did not sign)...Drafted by the Oakland Athletics in the first round (No. 20 overall) of the 2015 First-Year Player Draft...Signed by Trevor Schaffer. Named a MiLB.com Organization All-Star...Named a Texas League Mid-Season All-Star while with Double-A Midland...Named the Texas League Player of the Week on 8/26: .400 (8-for-20), 1-2B, 1-3B, 2 HR, 6 R, 5 RBI, 6 G...Ranked third in the Texas League in hitting (.300)...His eight triples were tied with teammate Eli White for the most in the Texas League...Set career-highs in games (118), runs (68), hits (136), total bases (199), doubles (29), triples (8), walks (44), and steals (25)...Hit .379 (39-for-103) with 12 doubles, two triples, a home run, and 10 RBI in 27 games in May...Hit a combined .343 (36-for-105) with five doubles, three triples, three home runs, and 13 RBI in 28 games in August and September...Had a season-high 11-game hitting streak from 5/22-6/2...Recorded his first career multi-home run game on 8/23 at Corpus Christi...Stole three bases in a game twice (5/30 vs. Arkansas and 7/16 at San Antonio)...Hit safely in 11 consecutive home games from 7/20-8/14, batting .283 (13-for-46) with a double, 10 runs, and two RBI...Hit safely in nine-straight road games from 5/11-27, batting .472 (17-for-36), with five doubles, a triple, home run, and three RBI... Reached base safely in 13 consecutive road games from 5/6-27, hitting .400 (20-for-50), with eight doubles, a triple, home run, seven runs, and three RBI. Spent most of his second professional season at Single-A Stockton where he batted .230 with three home runs and 31 RBI in 86 games…was promoted to Double-A Midland in September and went 5-for-15 (.333) with seven RBI in five regular season games with the RockHounds…combined to hit .235 in 91 games overall…was hit by a pitch 10 times and drew 39 walks for a .327 on-base percentage…stole 14 bases, which tied for eighth in the A's farm system…his .230 batting average at Stockton was fourth lowest in the California League…missed the first six weeks of the season after undergoing surgery for a torn meniscus on his left knee…hit .251 (63-for-251) with all three of his home runs against right-handed pitching compared to .192 (30-for-156) against left-handers…batted just .196 in 40 games at home with Stockton and went 0-for-3 in his lone home game with Midland…all three of his home runs came on the road…two came with runners on base…hit .211 with runners in scoring position at Stockton but went 5-for-6 (.833) in that situation with Midland for a .256 average with RISP overall…appeared exclusively at shortstop on defense where he played in 87 games and made 86 starts…committed 19 errors for a .948 fielding percentage…also went 2-for-12 (.167) in four games at designated hitter, all with Stockton… hit in every spot in the order except third through fifth and saw his most action with 31 games batting second…also hit .279 with a .362 on-base percentage in 27 games batting leadoff…was rated as the A's No. 9 prospect by Baseball America following the season. December 13, 2018 Baltimore Orioles claimed SS Richie Martin off waivers from Midland RockHounds. April 19, 2018 Midland RockHounds activated SS Richie Martin from the 7-day disabled list. April 5, 2018 SS Richie Martin assigned to Midland RockHounds from Stockton Ports. March 21, 2018 SS Richie Martin assigned to Oakland Athletics. September 26, 2017 Stockton Ports activated SS Richie Martin from the 7-day disabled list. August 31, 2017 Stockton Ports placed SS Richie Martin on the 7-day disabled list. August 1, 2017 SS Richie Martin assigned to Stockton Ports from Midland RockHounds. June 16, 2017 Midland RockHounds activated SS Richie Martin from the 7-day disabled list. May 31, 2017 Midland RockHounds placed SS Richie Martin on the 7-day disabled list. December 1, 2016 Oakland Athletics invited non-roster SS Richie Martin to spring training. September 2, 2016 SS Richie Martin assigned to Midland RockHounds from Stockton Ports. May 23, 2016 SS Richie Martin assigned to Stockton Ports from Vermont Lake Monsters. February 10, 2016 Oakland Athletics invited non-roster SS Richie Martin to spring training. July 2, 2015 SS Richie Martin assigned to Vermont Lake Monsters. June 30, 2015 Oakland Athletics signed SS Richie Martin.